Merry (early) Christmas! | Separated by a common language. Christmas came early this year for me when I got one of my top Giftmas wishes, JEERO! Jeero had to spend the night in my trunk because I was at a Christmas party for The Reflector (our school paper). Jeero is going to live on my fantastic, leopard-clad bed! Hurrah! What time is it? Jeero has no idea. How do you get from here to there? Don’t ask!…Jeero doesn’t know. Jeero just wants to sit on the couch with you and eat some snacks. Is that too much to ask? Jeero doesn’t know, but he does know that you know it is time to cancel your plans and hang out with him. Um, did someone say TOTALLY AWESOME?! 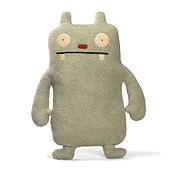 Either way, thank you Steve for my lovely Uglydoll! Looks like a girlfriend I once had. I never could get her to do all the cool things jeero does though. She just wanted to rollerblade in ball bearings all the time. Sit on the couch and eat snacks? Erm…sounds like I’m a human version of Jeero…. Joe you’re MUCH more attractive than Jeero! Stop being so hard on yourself man! Mizz, I sent something to your roswell account; I couldn’t remember the other address.